In this post, you will find everything there is to know about the Software updates for LEGO Worlds on Nintendo Switch (originally released on September 5th 2017 in North America, September 8th 2017 in Europe, and November 22nd 2017 in Japan). 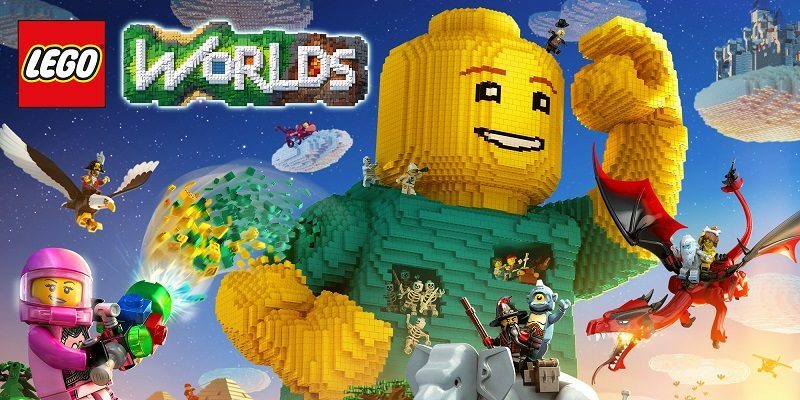 How to download updates for LEGO Worlds for the Nintendo Switch? To check that you have the latest version installed, simply select the game on the Home Menu, and press + or – to go to the options. The version number is displayed just below the game title. Additional details: unfortunately, no patch notes are available, so it’s not clear what was added and/or changed. All we know is that a new update is available! Added the Sky Spinner (Changes Time of Day). All Tutorial Videos added to Options menu to rewatch. Introducing the Planner, a tool designed to build a house rapidly and with ease! Use the various materials and pre-built wall types to get your new house/town/city underway! You can find the Planner Tool underneath the Build Tool sub-menu options. Another update to the Build tool! Instead of just tapping the button to place it, you can now hold the placement button to draw in an entire wall. After many content updates, DLC and Showcase Content, we’ve come to the conclusion that the Discovery Menu is no longer fulfilling its purpose. As a result, we’ve now added a tabbed system to make it much cleaner to find what you’re looking for, including the addition of Categories to help narrow down exactly what you’re after. Oh, and to make things even simpler, we’ve added a search function so you can really narrow down the ever-expanding list of Discoveries. And check out the Silhouettes to the grids so you can see exactly how much you’re missing! Additionally, you can now delete Custom Characters and Custom LXFMLs too! Sorry that took a while! Ever dreamed of being a Movie Director? Perhaps a YouTube personality? Maybe you just love the idea of taking some lovely wallpaper worthy screenshots? Well we have the car for you! A vehicle that can be utilised by either one player or two, providing you with all you need to set some epic action sequences, or possibly re-create that documentary you watched. We’ve slightly updated the waypoints. Instead of them scattering around everywhere, they’re much more localised to the area you operate in, and have clearer indications of exactly what they point to. We’ve slightly tweaked the Galaxy Map again too! We put the options behind a slider (cleverly disguised as PUG-Z) and made it all just a little tidier. Also, instead of a white 2D rocket, a micro-build of PUG-Z flies around the planet you are now on. Much nicer. We’ve added a few new shapes to the Landscape tools, to further improve just how you edit your Worlds! Press the ‘Shape’ button while you have a Landscape tool open to see all the new options you have at hand! We’ve made an alteration to how the Copy Tool functions on Controller. You can still choose an exact size, but we’ve also added a nice and simple ‘Hold to expand’ option instead of opening up the box with multiple options. Additional details: this update replaces the old Home Menu icon.